"The Hungry Ghost"— An Educational and Community Outreach Event (2019). Mike at Waterman's Community Center, North Haven. April 1, 2019— North Haven Community School & Waterman's Community Center. Island of North Haven, Maine. Michael Gorman was invited to the island of North Haven, Maine to be the Artist in Residence as part of their Arts & Enrichment program. 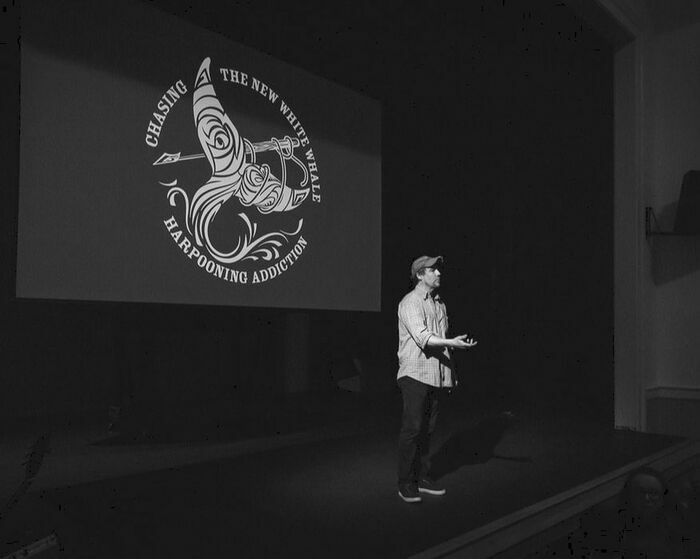 He and members of The Forty Hour Club presented a series of school workshops which culminated with an evening performance by students and a presentation by Mike about his work on the project "Chasing The New White Whale—Harpooning Addiction". The day-long series of workshops at the school tied into the community's upcoming playwrighting festival and incorporated elements of play-building including; language and metaphor; voice and projection; scenery and artwork; creation of a "scene"; and more. "The Hungry Ghost" is a parable and scene taken from Gorman's play "The Honor and Glory of Whaling", that deals with the themes of opiate addiction, loss, and family. Students (elementary to high school) read and acted out the scene on stage at Waterman's Community Center as part of the evening performance, which was followed by a presentation by Gorman about his Art & Advocacy model "Chasing The New White Whale—Harpooning Addiction". 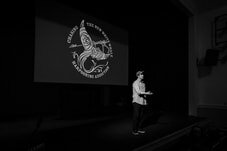 Mike talking to the audience about his work as a playwright and project "Chasing The New White Whale—Harpooning Addiction".